Blog Apache Tomcat Tutorials How to Run Multiple Tomcat Instances on One Server? I’m sure you must have faced one of below question while developing Dynamic Web Project in past. If yes, then you are at right place..
Let’s 1st understand Tomcat Directory Structure.. When creating multiple instances of tomcat server, we need to play with the folders inside the server. These folders contain the actual scripts and code for the server. We have the option to either use the code base for tomcat in shared mode where all tomcat instances refer to the same physical code or we can create separate copies of these folder for each tomcat instance. /bin : This directory contains the startup and shutdown scripts for both Windows and Linux. /conf : This directory contains the main configuration files for Tomcat. The two most important are the server.xml and the global web.xml . /server : This directory contains the Tomcat Java Archive files. /lib : This directory contains Java Archive files that Tomcat is dependent upon. /logs : This directory contains Tomcat’s log files. /src : This directory contains the source code used by the Tomcat server. Once Tomcat is released, it will probably contain interfaces and abstract classes only. /webapps : All web applications are deployed in this directory; it contains the WAR file. /work : This is the directory in which Tomcat will place all servlets that are generated from JSPs. If you want to see exactly how a particular JSP is interpreted, look in this directory. Having a good understanding of tomcat ports is essential to manage the multiple instances of the same server installation. These ports are used by tomcat for start-up, deployment and shut-down operations. Connector Port : This is the port where Apache Tomcat listen for the HTTP requests. Shutdown Port : This port is used when we try to shutdown the Apache Tomcat Server. AJP (Apache JServ Protocol) Connector Port : The Apache JServ Protocol (AJP) is a binary protocol that can conduct inbound requests from a web server through to an application server that sits behind the web server. Redirect Port : Any redirection happening inside Apache Tomcat will happen through this port. In Apache TOMCAT there are two instance where redirect Port is mentioned. First one is for the Apache TOMCAT server and other one is for the AJP port. How to Start Stop Apache Tomcat Server via Command Line? 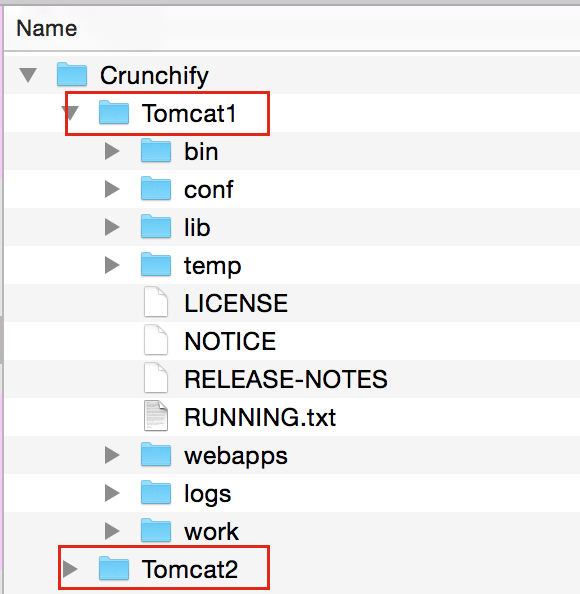 Lets start creating multiple Tomcat Instances in Mac environment..
Download and Copy Tomcat Instances under ~/Documents/Crunchify/ folder. Change below HTTP, HTTPS, AJP, Shutdown Ports for Tomcat2 instance. Startup scripts are a whole other topic, but here’s the brief rundown. The main different from running a single Tomcat instance is you need to set CATALINA_BASE to the directory you set up for the particular instance you want to start (or stop).